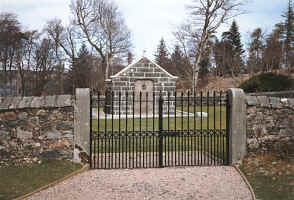 At Gruline just outside the village of Salen is the Macquarie Mausoleum which houses the remains of Lachlan Macquarie, his wife Elizabeth and his son also named Lachlan. Mention his name throughout Britain and very few people would know who he was and quite a lot of people on Mull would also probably not be able to tell you either. But mention his name in Australia and it would be very different indeed. Born on the island of Ulva off the west coast of Mull on 31 January 1762, his father Lachlan Macquerie, was a cousin of the sixteenth and last chieftain of the clan Macquarie and his mother Margaret was the only sister of Murdoch Maclaine chieftain of Lochbuie on Mull. Lachlan was one of four brothers: Hector (died 1778); Donald (died 1801); and Charles (died 1835). Lachlan began his army career at the age of 14 when he joined the British army as a volunteer in 1776. In 1777 he obtained an ensigncy in the 2nd battalion of the 84th Regiment, known as the Royal Highland Emigrants, and was posted to North America where he did garrison duty, first in Nova Scotia, and then in New York and Charleston. He was commissioned a lieutenant in the 71st Regiment in January 1781. In 1784 he returned to Scotland from his posting in Jamaica, and was reduced to half pay. Then in 1787, as a lieutenant in the 77th Regiment, he began a long association with India, remaining there until 1801. In 1793 he married Jane Jarvis, but their marriage proved to be brief and childless as Jane died on 15 July 1796 of tuberculosis. In 1801, while military secretary to Jonathon Duncan, Governor of Bombay, Macquarie was appointed deputy adjutant general to the 8000 strong army, under the command of Major General David Baird, that was sent to Egypt to defeat Napoleon and expel the French. 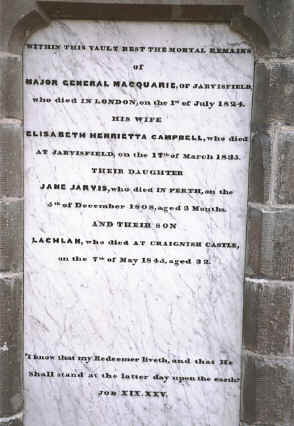 Macquarie returned to England in 1803 to attend to financial matters, but in 1805 he returned to India where he was promoted to lieutenant colonel of the 73rd Regiment. After serving in northern India until 1806 he decided to return to Britain carrying government despatches. After sailing from Bombay to the Persian Gulf, where he narrowly escaped drowning, he then travelled overland to London via Baghdad and St Petersburg. However the real reason for his return was to marry his distant cousin Elizabeth Henrietta Campbell of Airds whom he had met in 1804. They married on 3rd November 1807. The bride was 29, and the groom 46. She had a daughter, Jane, in September 1808 but she died on 4th December the same year. In April 1809 Macquarie was appointed Governor of New South Wales to replace William Bligh whose governorship had been wracked with controversy. Macquarie and his wife sailed with the 73rd Regiment from Portsmouth in the storeship Dromedary, escorted by H.M.S. Hindostan on 22nd May 1809, they arrived at Port Jackson on 28th December 1809 and he took up his commission as governor on 1st January 1810. Right from the start Macquarie saw the colony as a settled community and not just as a penal settlement. However his term of office also coincided with an increase in the number of convicts sent to the colony. He commenced an ambitious programme of public works with new buildings, towns and roads to help absorb these numbers. He also extended the practice of ticket-of-leave for convicts. This brought him into conflict with an influential conservative section of the local society who sought to restrict civil rights and judicial privileges to itself. Many of these free settlers also had influential friends in English political circles. This caused Macquarie a great deal of frustration and coupled with recurring bouts of illness this led him to submit his resignation on several occasions. A serious illness in 1819 almost proved fatal, and the pressures of a commission of inquiry into the state of the colony, headed by J.T. Bigge, reinforced his desire to end his term of office and return home so that he could defend the charges made against his administration. At the end of 1820 he learnt that his third application for resignation had been accepted but it was not until 12th February 1822 that he and his wife and son Lachlan departed for England. Elizabeth had given birth to her son after having had six miscarriages on 28th March 1814. In 1822-23 he took Elizabeth and Lachlan, with servants and a tutor on a grand tour through France, Italy and Switzerland because he was worried about Elizabeth’s health. In January 1824 he finally retired with his family to his estate on Mull. In April 1824 he went to London as a number of matters still remained to be resolved with the government and he also wanted to secure the pension that he had been promised. Unfortunately he suffered a recurrence of the bowel disorder that was a legacy of his service in India. Elizabeth hurried down to London from Mull and was just in time to see him before he died at 49 Duke Street, St James on 1st July 1824. 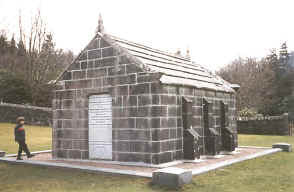 The Mausoleum which was erected over Lachlans grave by his wife in around 1834 is owned by The National Trust of Australia (NSW). 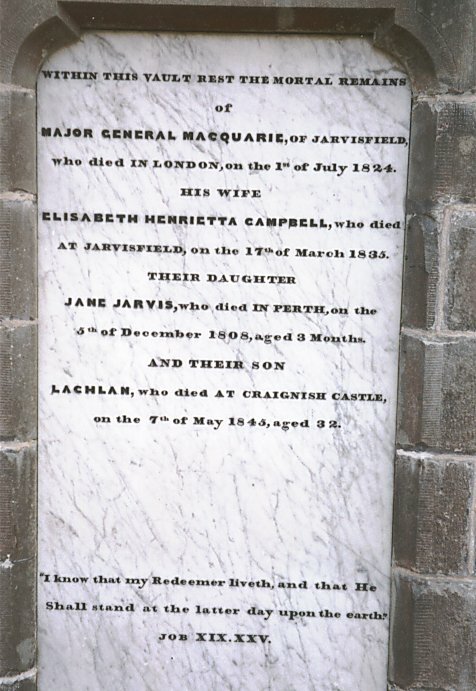 The panel at the southern end of the Mausoleum is a memorial to Lachlan Macquarie himself and the panel at the northern end is to Lachlan, his wife Elizabeth and their children. On 7th June 2000, the Australian Prime Minister, Mr. Howard, announced in London that the Macquarie Bank of Australia had donated 70,000 Australian dollars for the mausoleum to be refurbished and this was being carried out in the summer of 2000. Lachlan Macquarie is so famous in Australia that his name has been used for just about everything. There is Macquarie University, Macquarie Island, Macquarie River, Macquarie Streets, Macquarie Hills, Macquarie Pass, Macquarie Grove Aerodrome, Macquarie Falls, Fort Macquarie, Macquarie Plains, Mount Macquarie, Port Macquarie, Macquarie Fields, Macquarie Galleries, and even Macquarie Garage and Macquarie Teashop. Trailer for drama documentary Lachlan Macquarie: The Father of Australia. He was the Scotsman who changed the penal colony of New South Wales into the community that was to become Australia. 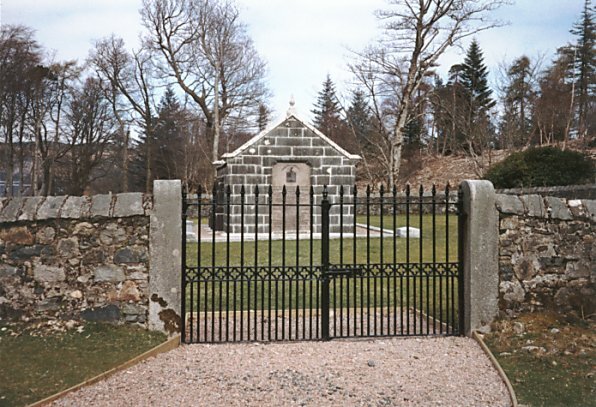 This article was kindly provided by Linda Crossley who runs Dunvegan Cottage B & B, Salen, Isle of Mull, where the Macquarie Mausoleum is located.